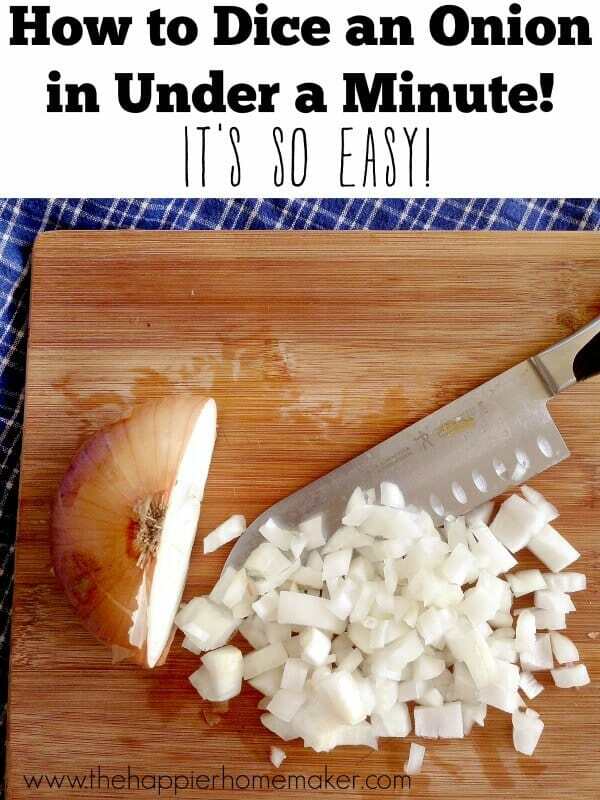 How to Dice an Onion in Under a Minute! Every year for Thanksgiving my Mom and Stepfather come to visit (which says a lot since we move all over the place!) and my stepfather and I cook the holiday meal. He’s an amazing chef-I shared his recipe for Grand Marnier Cranberry Relish a while back. A few years ago as we were prepping some delectable sausage stuffing I saw him dice an onion in less than a minute and begged him to teach me how to do it. It’s so easy once you “get” it and it makes meal prep a breeze. 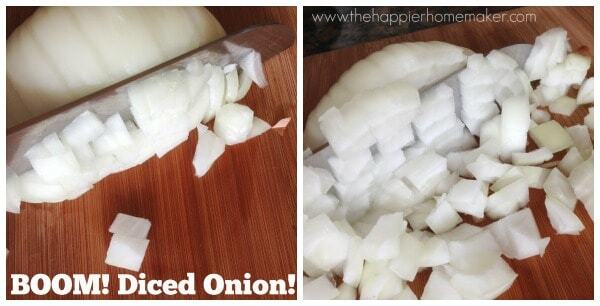 Today I’m going to share how to easily dice an onion with you too! 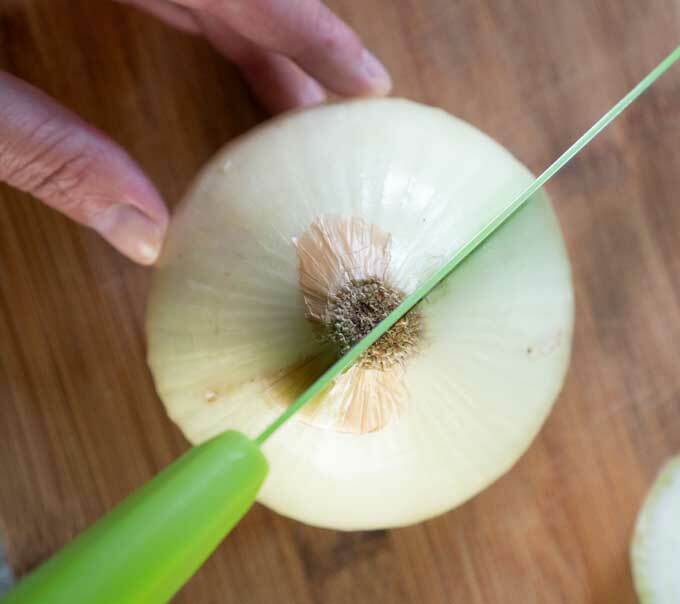 Let’s start by making sure we’re on the same page as far as the two ends of the onion…there is the root side which has a flimsy little piece sticking off, and the basal side which looks like a little hairy button (sorry-tell me a better way to describe it and I’ll edit the post!) We’re going to start by cutting off the ROOT side. Make sure you cut off the proper side or the whole thing won’t work. 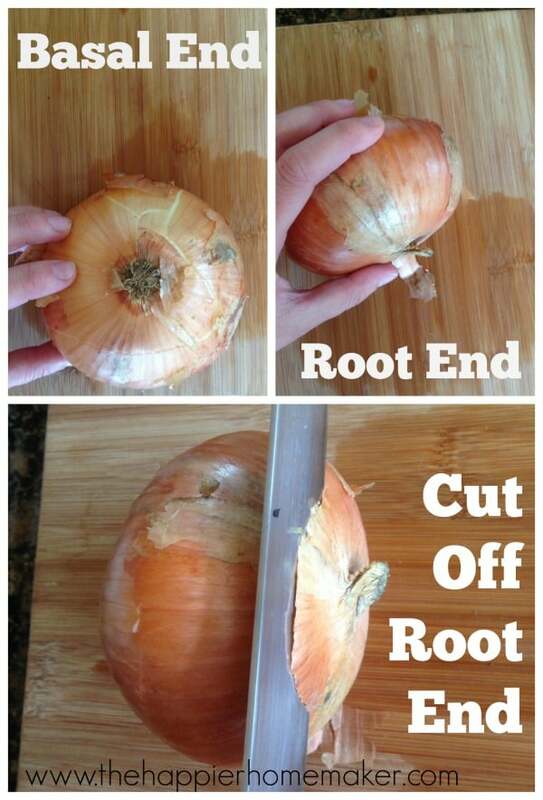 Now turn the onion over so it’s sitting on the side you just cut and slice the onion in half right through the center of the basal end-it’s important that each half has part of the basal end-this holds the onion layers together as we slice it. 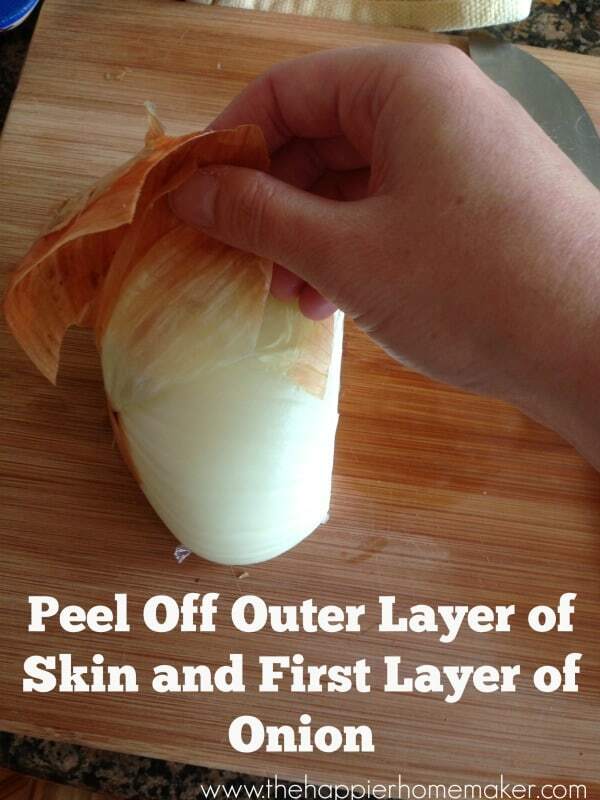 Peel off the outer skin of the onion and remove the first layer-this is the oldest and often gets dried out. 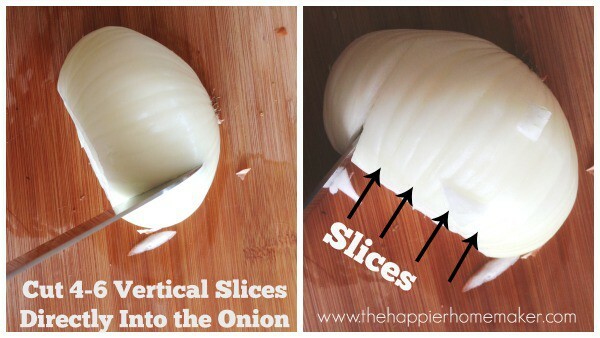 Place the flat portion of the onion on the cutting board and start cutting horizontal slices from the bottom to the top (watch those fingers!) and be sure not to cut all the way to the basal end, I usually leave about a 1/2 inch between the basal end and where I stop cutting. Now we slice vertically down, about 4-6 times again being sure not to go all the way to the other side of the onion, leave about a 1/2 inch to spare. Now I usually don’t worry about that bit of onion that isn’t diced at the end but if you’re a waste-not, want-not kinda person just carefully slice the “nub” that’s left over at an angle to finish it off. If your onion pieces aren’t as fine as you would like you can easily dice a little more on the cutting board as well. So-did you know this trick, am I the only one that goes through life more than 30 years without learning this?? This is how I do it. Once you get over the nerve of cutting off your fingers, it really is quick and easy! I hate to be the wet blanket, but the basal plate and the root end of the onion are one and the same (the end with the flat disk). The other end (which you labeled as root) is actually the stem end. That said, the actual directions are exactly what I learned from a chef in college and work marvelously. Thanks for the clarification! I’ll update the post!